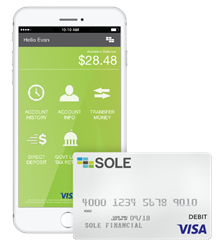 Partnering with SOLE will allow clients of ExponentHR to offer payroll cards to all of their unbanked employees. SOLE Paycard holders have access to direct deposit and mobile banking without a traditional bank account. SOLE® Financial, a leader in the prepaid payroll card market, has partnered with rapidly growing HR software provider ExponentHR, to offer the SOLE Visa® Payroll Card to Exponent’s commercial client base. Payroll cards are one of the fastest-growing payment products according to Aite. Offering the SOLE Paycard, enables Exponent’s clients to provide additional efficiency and benefits to their employees. Payroll cards are becoming an increasingly essential component of workplace benefits, especially in industries that employ unbanked and highly-distributed workers. Paycards provide unbanked employees with easy access to payroll funds without the nuisance or cost of check-cashing, money order, and other alternative financial services. SOLE Financial is a rapidly growing company in the payroll card marketplace. Since 2010, SOLE’s topline revenue has increased by 346% while its active funded cardbase has increased by 394%. SOLE serves over 3000 employer clients nationally. SOLE Financial aims to serve the underserved by providing a low-cost alternative to predatory check-cashing services for un- and underbanked employees. By partnering with employers to achieve 100% direct deposit, SOLE saves employers time, paper and money while providing the convenience and dignity of traditional banking services to the unbanked workforce. SOLE Paycard holders can access their hard-earned paycheck at no cost through point-of-sale and cashback transactions. ExponentHR is the fastest-growing technology firm in the HRIS sector. With a unique approach to solution development, a single application platform, and a dynamic distribution model, ExponentHR provides the ability to reduce operating cost, gain live access to critical financial data, engage and retain valuable employees, and establish scalable infrastructure. ExponentHR is an HRIS, payroll/tax service, benefit and ACA administration tool, employee communication portal, reporting system, and more, delivered via the Software as a Service (SaaS) model.